-Lenovo has started rolling out Marshmallow update for Lenovo K3 Note via OTA update. The update will be rolled out in phases and will take time to reach all devices. The latest Android M adds TheaterMax support for an immersive VR experience. This feature is available only in the latest Lenovo devices namely Vibe K4 Note, Vibe X3, and Vibe K5 Plus. Apart from that, it brings Marshmallow features like App Permission, Web Experience, App Links, Doze Mode, and Power & Charging. 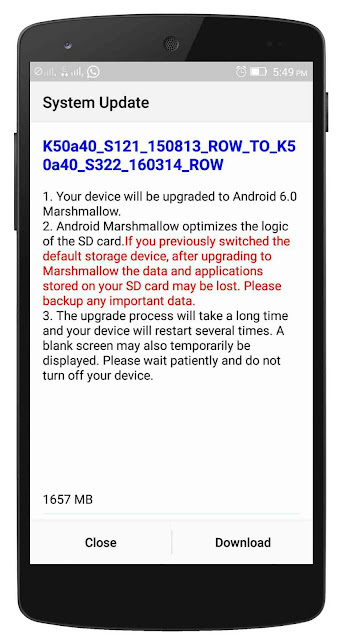 K3 is the First Lenovo device to get Marshmallow update through OTA. You can also update through the Lenovo service center near you. This entry was posted in Android and tagged K3 Note, News, Updates.